I am now seven for seven in the goals-finished category for the year! A Lovely Year of Finishes certainly makes it easy to set goals and finish them. My goal for July was to finish this quilt. The quilt was completed and hung in the Greater Ann Arbor Quilt Guild's show this weekend! I am very pleased with how cheerful the finished product is! Time did become a crucial factor. My original intention was to echo quilt around the appliques and do some sort of custom quilting in the nine-patch blocks. (Yes, those are nine-patch blocks.) However, my volunteer work for the show took a bit longer than I expected. 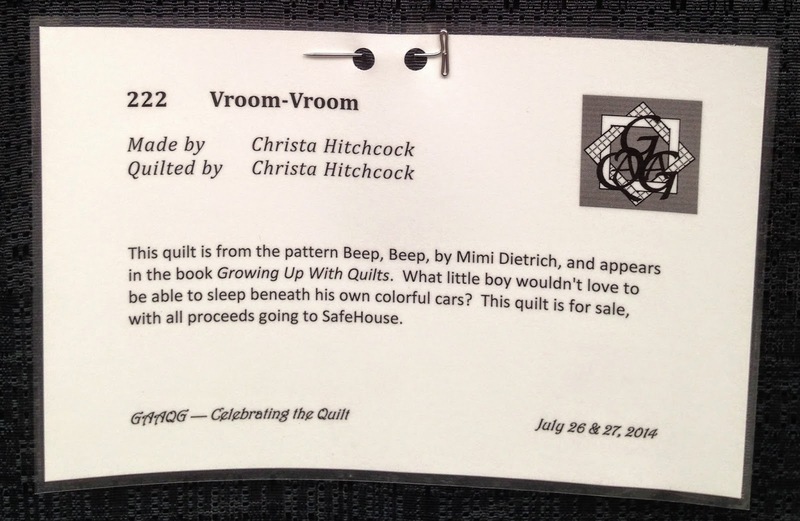 I put together a great deal of the show booklet, and I produced the cards that hung by each quilt. As I trimmed and punched holes in the cards, my good friend Pauline quilted the quilt for me. (Wasn't able to re-make the card to give her credit there, but want to give her a shout out here! Thank you, thank you, thank you, Pauline. You are a fantastic friend!) 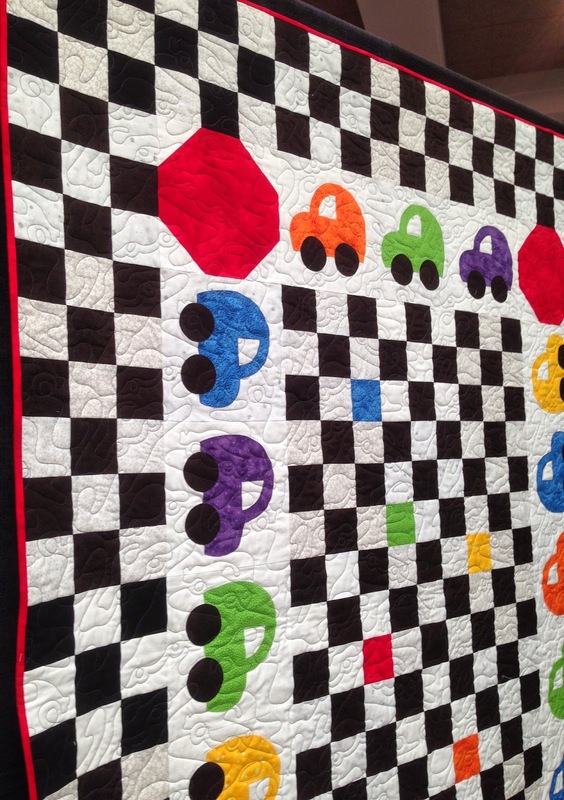 A panto that included cars and loops was the perfect quilting pattern to use. Unfortunately, I don't have a picture of the fabric I used on the back, but it can be seen here. It was Hot Wheel cars on a white background. I just love this quilt. When I started it, I was going to give it as a donation quilt to SafeHouse, but at this point it might stay in my collection. 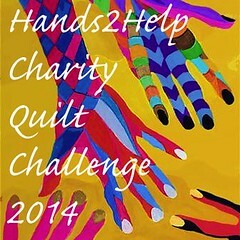 If so, I will make another quilt as a donation quilt. My goal for July for ALYOF is to complete the quilt I worked on last month. 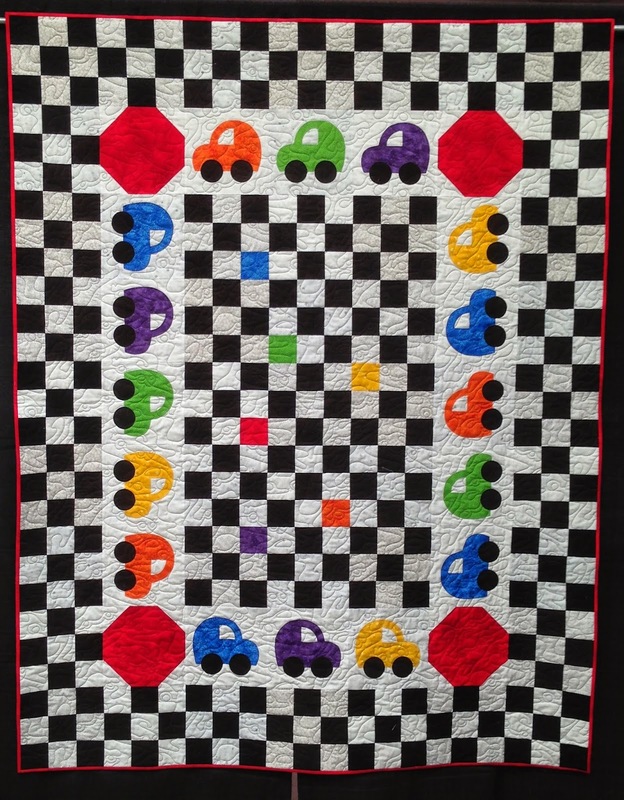 In June I completed the stitching around the appliqued cars, and this month I will complete the quilt. 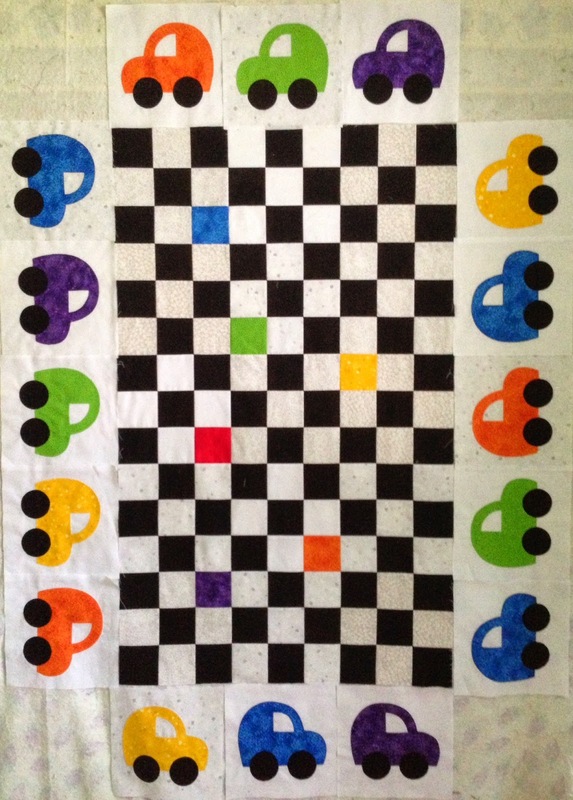 The quilt is from the book, Growing Up With Quilts, by Mimi Dietrich and Sally Schneider. This pattern is one of Mimi Dietrich's. In the corners, there are blocks to represent Stop signs, and then there is a final border of black-and-white 9-Patch blocks. I have ordered some HotWheels fabric for the backing and have my red binding all ready to go. I started this quilt as a donation quilt to SafeHouse, through Greater Ann Arbor Quilt Guild, but I might be having second thoughts. It's awfully cute! Be sure to stop by Sew Bittersweet Designs or Fiber of All Sorts and check out all the other quilters who have stated goals for the month of July.